1. Attach Eagle Claw 413 to vise with point down. This hook always rides point up, less gill hooked fish, but the point does need to be touched up before tying. I prefer size # 1 for halibut as the corbina, bigger perch and croaker can also get it in there mouths. 2. Wrap the hook shank 1/3 way back from the jig bend with clear mono tying thread for a base. 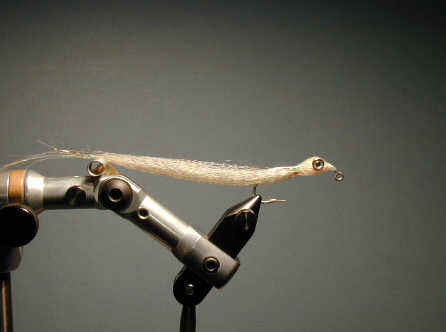 Attach weighted eyes on top of hook shank just back of the bend in the jig hook near the hook eye. I like the Spirit River Real eyes with 3D inserts. 3. Turn hook 180 degrees so the hook is now point up. All materials will be attached to the “inside” area of the hook shank (not the “top”). This insures hook rides true and point up and can reduce fowling of material around hook. At the middle of hook shank tie in 15 to 20 pieces of “polar bear” ultra hair 3″, then 6 or less pieces of 3 1/2″ pearl flashabou. On what will be the top of the fly when riding hook up, add about 15 of pieces of light olive ultra hair 3″. With each material, work closer toward the eyes. The last material should be tied in just short of the eyes. Now tie in diamond braid a little less than a quarter inch back of the eyes and wrap neatly forward covering the tie in points of the other materials and cross wrap over the gap in the eyes to fill in. 4. I like to trim the ultra hair top and bottom to get a tapered look. Also inspect for “sparseness.” It is very easy to apply to much material or flash to this fly. I think its effectiveness hinges on the translucent nature of very little material. In clear water I will sometimes bite off half the flashabou leaving only two or three strands and its effectiveness improves. 5. Now the head in the area of eyes and diamond braid has to be epoxied. I like Crystal Clear Epoxy as it has a 20 min work time and never yellows! 6. This fly is so durable I once fished the same fly for 5 weeks (3-5 days a week) and caught close to a hundred halibut with it by just retying to the leader once in a while! I carry a doll comb with me to comb out the knots the halibut and croaker put into the ultra hair.